This demo is implemented in the single Python file demo_von-karman-mansfield.py. This demo program solves the von-Kármán equations on a circular plate with a lenticular cross section free on the boundary. The plate is heated, causing it to bifurcate. 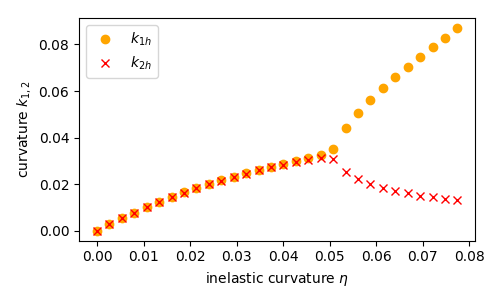 Bifurcation occurs with a striking shape transition: before the critical threshold the plate assumes a cup-shaped configurations (left); above it tends to a cylindrical shape (right). An analytical solution has been found by Mansfield, see . Pre-critical and post-critical plate configuration. The standard von-Kármán theory gives rise to a fourth-order PDE which requires the transverse displacement field \(w\) to be sought in the space \(H^2(\Omega)\). We relax this requirement in the same manner as the Kirchoff-Love plate theory can be relaxed to the Reissner-Mindlin theory, resulting in seeking a transverse displacement field \(w\) in \(H^1(\Omega)\) and a rotation field \(\theta\) in \([H^2(\Omega)]^2\). To alleviate the resulting shear- and membrane-locking issues we use Partial Selective Reduced Integration (PSRI), see . Define a MixedElement and a FunctionSpace from it. Write variational forms using the Unified Form Language. Automatically derive Jabobian and residuals using derivative(). Apply Dirichlet boundary conditions using DirichletBC and apply(). Define the Reissner-Mindlin-von-Kármán plate equations using UFL. Use the PSRI approach to simultaneously cure shear- and membrane-locking issues. We start with importing the required modules, setting matplolib as plotting backend, and generically set the integration order to 4 to avoid the automatic setting of FEniCS which would lead to unreasonably high integration orders for complex forms. The standard von-Kármán model can be recovered by substituting in the Kirchoff constraint \(\theta = \nabla w\). Comparison with the analytical solution. E. H. Mansfield, “Bending, Buckling and Curling of a Heated Thin Plate. Proceedings of the Royal Society of London A: Mathematical, Physical and Engineering Sciences. Vol. 268. No. 1334. The Royal Society, 1962. © Copyright Matteo Brunetti, Jack S. Hale, Corrado Maurini Revision ece54beb.